How can you assure customers that you really do take exceptional care with their vehicles? 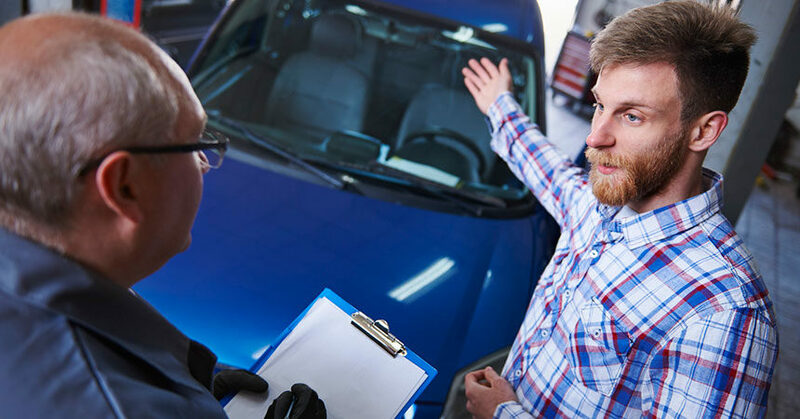 When it comes to auto sales, outstanding customer service is critical to maintaining great relationships and repeat customers, so reducing unnecessary service department claims disputes can be a huge difference-maker. Think about all that marketing and sales work just to get a customer onto your lot. But in the end, you made the sale, everybody was happy, sales numbers look great for the month—and unfortunately, that’s not all, folks. Once customers drive off the lot in their shiny new vehicle, it’s all too easy for them to forget about you. This is especially troublesome when it comes to winning them back when they’re ready to buy their next vehicle. That’s where your service drive can make the difference. Offering a superior maintenance and repair experience is your best shot at keeping customer satisfaction high, and retaining customers for their next purchase. This presents both an easy opportunity for success—or, if something is perceived by customers as wrong, a good risk of losing them to your competitor down the road. That’s why vehicle condition reviews are so important. Our research found that 75% of customers surveyed would not return to the service drive if they felt employees had damaged their cars. Meanwhile, 80% would not return for another visit if they thought an item went missing from their car during a service visit. Your service team is top-notch. It takes great care and pride in servicing customer vehicles. Perception, though, is reality. How can you assure customers that you really do take such great care with their vehicles? Even more critical: How can you avoid unnecessary and costly claims disputes? There is no faster route to a lost customer than via a service department claims dispute that leaves a bad taste in everyone’s mouth. Fortunately, there is a way to significantly reduce these claims to a bare minimum, and in the process, maintain your repeat customer batting average at all-star levels. A great example of this is the approach taken by Southern California–based Pendragon-Hornburg (P-H), the venerable Jaguar Land Rover dealership with five locations that’s been serving its community since 1947. Obviously, when it comes to high-end auto sales, perceived outstanding customer service and the way you deliver that care is even more critical to maintaining great relationships and repeat customers. Jaguar and Land Rover customers expect exceptional service and vehicles that are in fantastic condition, so reducing unnecessary claims disputes can be a huge difference-maker. The P-H service center works on about 50 to 60 cars each day. Unfortunately, until recently, the P-H service team used paper forms to record vehicle condition, which limited its ability to hone in on particular damage. Before maintenance was performed, a paper form with a car silhouette was used to mark preexisting damage, a very imprecise process to record a car’s condition. When customers came back and saw damage on their car, they assumed it was caused in the shop. The paper forms couldn’t accurately capture the damage that was already there. This caused unnecessary disputes and loss of customer confidence in the team’s ability to keep vehicles in great condition. P-H also had an arrangement with a local body shop to take care of minor damage for free, which meant the body shop had to push paid jobs aside to tackle the free (claims) jobs. Clearly, P-H needed a much more efficient process to reduce and manage damage claims disputes. In response, P-H service manager Rebecca Korban deployed an app that enables dealerships to automate the asset management component within its service, sales, rental, and leasing departments by digitizing condition reviews of the asset. She continues, “The best part is that they don’t mind it at all. Much of the damage is often on the passenger side of the vehicle, which they don’t often see. Once we share the pictures with them, they’re accepting of it and often ask for a recommended shop to take care of the damage. Just as Korban discovered, by more efficiently recording a vehicle’s condition before and after each visit, your dealership can avoid misunderstandings and accusations that it was your team that caused damage, not the customer. One final point: You and your team are driving toward exceptional CSI scores. Instituting strong vehicle condition reviews—and giving your employees the tools they need to perform those reviews—will go a long way toward driving customer satisfaction and keeping those scores high. And, of course, it’ll also go a long way toward retaining those customers for their next vehicle purchase. Shane Skinner is co-founder and CEO of Record360, a digital documentation solution for dealerships and asset rental companies to decrease damage disputes and costs, and boost customer service. Prior to founding Record360, Shane worked as a controller and business manager for Enterprise Rent-A-Car, where he was responsible for providing leadership and strategic direction for assorted business units, including vehicle rental, commercial truck, retail dealerships, and vehicle financing. Learn more at www.record360.com. Is Your F&I Department Overrun by Tech Zombies?